Hey ladies! Just a heads up... Swiss brand Enavose is exploring the axiom 'you are what you eat' with her Juice Your Way to Fresher Skin Workshop. At the workshop, you will be learning how to make concoctions oozing with skin goodness from antioxidants, minerals and vitamins! These drinks will help keep your skin hydrated and healthy and woes are kept at bay! There are 2 slots for the workshop; on September 7th (From 6.30pm to 8.00pm.) and September 8th (From 11am to 12.30pm.). It's $60 for one person and $100 for a couple. These prices are fully redeemable for Enavose products and include a goodie bag (Worth $80!) and refreshments! 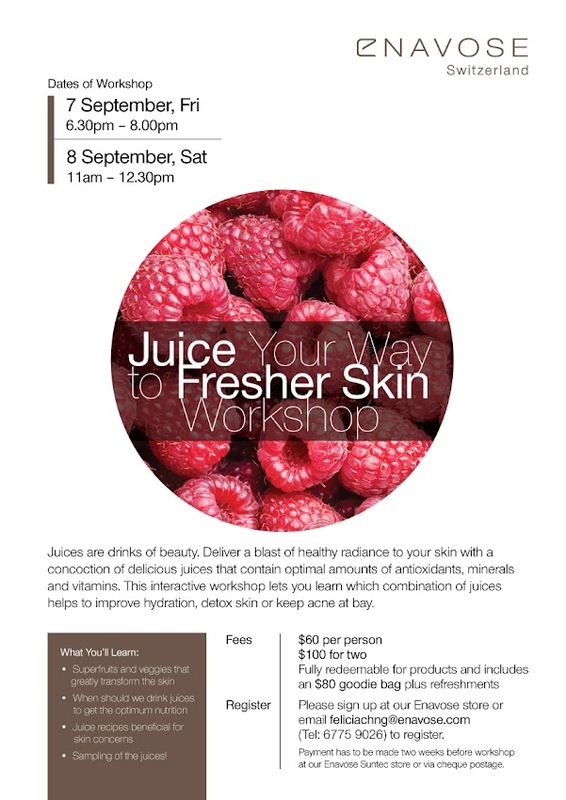 To sign up for the workshop, you can do it at Enavose stores or email Felicia at feliciachng@enavose.com to register.